One of the most amusing aspects of the English language is the expressive little agricultural witticisms that really clever people coin, gems that become part of our culture and language. Some so appropriate to the moments, both awful and wonderful, that stud an outdoorsman’s life. Some so memorable that they rise readily to the lips whenever the occasions demand. Ever heard that phrase ""Up s#~t creek in a barbed wire canoe" before? Ever wondered what it meant, desired an analogy? No? Well, I think it is necessary to enlighten you, to expand your horizons, to give you examples of plights so dire that your little problems will pale into insignificance. So that when things get really desperate, you too will have a story to show that things really could be worse. Canoeing was fun, as a teenager, on the West Coast of the South Island. Water was the one thing rarely ever in short supply. With the annual rainfall being around 150 inches, this meant lots of aqua in all forms from flat lakes to bumpy rivers. 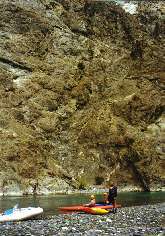 We’d spent large amounts of time paddling the Crooked River, splashing around Lake Brunner, been from Lake Poerua to Te Kinga, Lady Lake to Te Kinga, even braved the rocks and rapids of the Crooked gorge a few times. So we are experienced at kayaking, right? At least in the sense that we were not novices, if nothing else. At least, in our view. This was a long time ago, before plastic was invented, and they were just making canoes from fibreglass. In fact, our first canoes were painted canvas over wooden frames. This was before white water canoe clubs existed, nearly 30 years ago. My, how time flies! By canoe. Down the mighty Clarence River……. Me and my brother Gerry, father-in-law Ron, and brothers-in-law Don & Keith. My brother and I each had fibreglass touring boats, of reasonable volume, and quite stable. Ron and Don had a 16ft fibreglass Canadian canoe. A lovely green, truly a thing of beauty, and a joy to behold. Keith, the other brother-in-law, had gotten wind of the plan and reckoned he should be counted in as well. Bravery and enthusiasm are wonderful attributes, huh? He picked up his shiny new green and white fibreglass canoe on Christmas Eve. With our departure set for early on 26 December, his solo training experience on the Waimakariri River, Christmas morning, must surely have filled him with foreboding. He arrived home very late for Christmas dinner, soaked to the skin, cold and worried. His sole comment a cryptic, "Christ, they’re tippy bastards, aren’t they!" Boxing Day, 26 December 1981 dawned clear and bright, the forecast was good, and the team departed early for Hanmer Springs. The Clarence River rises on the east of the Southern Alps, near Lake Tennyson flows southward to Jacks Pass at Hanmer Springs, then runs north-east between the Inland & Seaward Kaikoura ranges, finally reaching the Pacific Ocean some 50 kms north of Kaikoura. The canoe trip, from the Accommodation House to State Highway 1, is around 200 kms, or 150 miles. Most groups allow 4-5 days to enjoy the spectacular scenery in this unspoiled wilderness area. There is no easy access into the lower sections of the river, just a couple of rugged 4WD tracks which are not all- weather accessible, that’s it. Any boating problems must be resolved on the riverbank, or boats abandoned whilst owners walk out, climbing over the rugged mountain ranges in the process. So, not unmindful of the consequences, equipped to deal with all eventualities, the team set forth, waving to the spouses who’d come to cheer the departure. And go home to soft, comfortable beds, refrigerators, televisions, and hot baths, bewildered at their husband’s stupidity, no doubt. The day was hot, the adrenaline pumping, and it was a happy, exuberant crew of canoeists, setting off in their motley fleet. An undercurrent of apprehension, heading into the unknown, added to the atmosphere, as it always does when adventurers go forth. Things went quite well, at first, especially for the kayak team. Keith had a few control problems, and was observed going into rapids in sundry unorthodox fashions – left sideways, and right sideways, with no obvious preference. Backwards even, a few times, which none of the other members felt any inclination to emulate. His technique quickly evolved – get it straight, clamp finger to cockpit edges, thumbs to paddles, scrunch down as low as possible, and hold on tight. Remarkably effective, a bit like a walnut shell bobbing along! Gerry and I, having so much more experience, were in much better shape, and the conditions were good for us. Ron and Don, usually such good friends, were experiencing co-ordination problems. When the time for evading action was at hand, each seemed instinctively to apply the same paddle strokes to miss the obstacle. If they were not one in front, one behind, if they were not paddling on opposite sides of the canoe, this would have worked well, I believe. In fact, I don’t think they would have hit the rock, rolled the canoe, and emptied all our food and equipment into the river. No, that was an accident, I’m positive. And quite hard to understand why each should blame the other, because both were doing the "right" thing. Repairs necessitated an early halt to the day, at the mouth of the Dillon Stream, picturesque, and sited not far from the first of the three significant gorges. Home to the Chute, and the Pinnacle, whose reputation had not escaped our notice. My boat had also sustained some skin damage, gravel rash, a hole or two, so it was a slightly subdued team who hunched over the campfire at dinner, as the shadows lengthened. Trout, remarkably enough. A good one, some 6 lbs, my brother wheedled it from the water with a tempting red, juicy worm. The river rumbled metres away, the thoughts of the gorge uppermost in all our minds, I think. Enough drama already, in the easy waters of the open valley. The Canadian was badly bent and bruised, tape-covered, its two occupants perturbed and already making contingency plans should Day Two go badly. Sleeping on sand is good when it’s hot. By 2 am it is not hot. The ominous rumbling of the river means sleep is erratic, disturbed. Day two dawns crisp and fine, the daylight bringing sand-flies, little black insects about the size of a flea. Hungry too, as are the team. Bacon and eggs, toast and coffee, ideal ingredients for that which lies ahead. The gorge looms, and a more frightening way to commence a morning is hard to imagine. As the valley narrows, the grass and tussock gives away to rocky cliffs, jagged and ugly. Huge shattered rocks line the river, smoothed at water level, sharp above. The river’s noise intensifies as the first rapids, compressed and irritable, threaten us. Several reconnaissance stops are made, to evaluate the way ahead. Things progress slowly, cautiously, everyone mindful of the consequences of another swamping of the Canadian. A couple of swims for the kayak team, and we arrive, all too soon, at the "Chute." An ugly spot back then, with a row of big boulders through which the water rumbled, then narrowed and dropped quite a few feet. Worse, a single monster rock protruding in mid-flow necessitated immediate avoiding action in the seething cauldron of white water. At first, a portage seemed like a good plan. The almost sheer walls of the gorge, coupled with the jumble of enormous boulders at water level, made this an extremely difficult proposition. The kayak team elected to run the section, figuring that the worst thing that could happen would be a swim. The Canadian was manhandled, manoeuvred and manipulated around the worst of the white-water. After emptying out the water from a couple of the kayaks, the journey resumed. Everyone is feeling grim, tense and apprehensive. Now long later, the worst fears are realised as the Canadian strikes another rock, opening up the bottom again. The problem with fibreglass is, once it starts to go, its damned hard to prevent the progressive softening of the area around the break. This was a major structural problem, one beyond the ability of "Bear" tape to fix. Conference time, and an evaluation of the options. Basically, the guys decided that the repair resources available were not going to guarantee the boats ability to sustain another 2-3 days of this type of water. The collective view was that it would be better to haul the Canadian high and dry. Then, to fill it with rocks to stop it blowing away, and for the two occupants to walk out over the mountains to the Inland Kaikoura Road. At the point we were at, near the bottom of the first gorge, the mountains were significant but not technically difficult, and a days walk should put the boys down at the road near Cloudy Range farm. So, off they went! Luckily, we were well enough equipped in terms of footwear, packs etc, and aside from the big climb, the heat, and the matagouri and briar thorns, their journey was but a minor epic. Mind you, they’ve been talking about it for the past 20 years - the mountains keep getting higher, the thorns more murderous etc. Keith, Gerry and I took what equipment we could, stuffed all the spaces on our three kayaks, and paddled off into the unknown. 20 years on, I still remember the sense of dread, it never left me on the entire trip. I know it was worse for me, as I was the leader, the architect of the expedition. The others were ok, nervous, but naïve. I knew clearly that I was operating in an environment where my skills were barely adequate for my own safety. Not only that, but I was responsible for the other two as well as myself. Having cleared the first gorge, the river mellows and the pace became pleasant, enough white water action to be interesting but not too scary. Keith was really getting the hang of his boat, and there are only a couple of swims between us. Somewhere around Quail Flat, Gerry performed a most unusual vertical ballet – he is leading, goes over a big flat rock with an unexpected hole behind it, and the nose of the boat digs in behind a rock! The boat is vertical, buried to the cockpit. It bobs up a little and clears that rock, only to catch the next, and the next, and the next. Impressive, but not something Keith or I ar eager to emulate so we slide carefully through the inside line. Not long after, we strike one of those horrible places where the river plunges headlong into a rock wall, with a big eddy and backwash on the upstream side, and a cauldron of white water downstream. Keith falls out as soon as he sees it coming, Gerry is too close and falls out trying to miss him. That leaves me taking evasive action, right into the upstream eddy, and the backwash. Now that really is a predicament! The fast water is at least foot higher than the slow, and getting out was every bit as unpleasant as I expected it to be. I did stay upright, but the river tore the spray skirt off, filing the boat with water. Boy, is it hard to control then! However, dignity intact, I flounder down to join the other two, and we empty out together. Evening sees us well beyond Dillon Cone, and it’s been a long, tough day. Still, sleep does not come easy, the river noise is hard to ignore and thoughts of the second gorge tomorrow are hard to repress. Gorge two is an anticlimax to some degree, not as bad as the first gorge. Sure, there was some adrenaline flow, but nothing nasty in it. Mt Tapuae-o-Uenuku eventually slides by on the left, and we enter the third gorge. This one is long, demanding and peppered with Grade III+ rapids that scared the living daylights out of us. I can’t believe the river can drop so much, so quickly, and some of the rapids are beyond belief. We all swim at some point or another, but we are getting steadily better at meeting the challenge. Perhaps the worst aspect is the anticipation rather than the reality. Every flat, quiet section is followed by a dramatic, boulder studded mayhem of whitewater, to the point where apprehension levels rise every time the water slows and flattens. The gorge twists and turns, and as the day closes we are still trapped in its malevolent grip. I’ve spent most of my life near water, camping, hiking, hunting, boating. Usually, its steady rumble is soothing, comforting, and pleasant. Not on this trip. Every time the eyes droop shut, the river noise synchronises with the relentless vision of turbulent white-water, holes and haystacks, rocks and bluffs that unfold across the backs of our eyelids. Sleep is fitful, and all the while the river snarls away in the background, threatening more punishment the next day. Stumbling around, stiff and cold, lighting the fire to cook breakfast. The sun is up, but the walls of the gorge prevent its appearance for hours. Nothing is as dry as any of us would like, and the ever-present rumble of the river does not allow you to forget what lies ahead. So, its kind of hard to smile and look happy, knowing that its more than likely that one or all of us will be swimming in it before long. We are further through than we’d dared hope, and before long the first signs of civilisation appear – oh joyous sight, a 4WD track high above the river, a fence. Cattle. Then, a turn to the right and we are clear, the mountains turn to hills. Limestone hills. The valley flares out, wide and gravelled, braided streams that split and rejoin. The relief is enormous, as we know that there are only a few short hours of paddling left to go. There are blisters, sore muscles, sunburn and lack of sleep, but the smiles are more frequent with the knowledge that we are on the home stretch. Still, it’s a long paddle down to the Glen Alton bridge, the entry to the last section. This last section is impressive! Only 30-40 minutes, but some of the biggest rapids on the whole river live here! In fact, some guys drive all the way from Christchurch, some 3 hours, just to do this bit! The gravel disappears, replaced by a bed lined with huge grey boulders. The haystacks on these rapids are enormous, and so close together that you barely have time to draw breath as you emerge before plunging in over your head through the next. The State Highway One bridge is a relief. We have completed the journey, physically unscathed. Mentally, I certainly carried some scars. Ever since then, I have understood very clearly the enormous weight of responsibility that lies on your shoulders when you take others into the wilderness. I consider myself lucky to have learned those lessons, on that trip, without serious consequences. Never again have I lead a trip without ensuring that the requisite skill levels and safety margins exist. It built character, improved skills, proved our determination and courage. As adventures do, in the great outdoors. Overall, I did not enjoy the trip, in retrospect it was more like a survival course. This was due to the leadership responsibility, the worry and uncertainly, and the overwhelming sense of not being in full control of the situation. Every descending twist in the river brought dread, every rapid, every time the river plunged over the short horizon and I could not see the bottom until the brink was reached. For 20 years, I have always said that "I have never been so scared, so many times, in such a short space of time, in all my life!" Which is quite something really, because I’ve been shot, thrown off horses, survived an aircraft wreck, plus sundry jet-boat, car and motorcycle crashes. And I’ve firmly declined all invitations to do it again. In fact, that was the last time I kayaked for nearly 20 years. It did not interfere with my other boating, or enjoyment of water sports, but I just knew that whitewater kayaking was not my particular forte. I’d survived that particular baptism of fire, and I was not recklessly going to tempt fate quite so hastily again. There was, however, always a sense of accomplishment, and a great deal of satisfaction from only swimming 4 times in those 200 kilometres. Part II: The Last Clarence River Expedition. Nowadays, we are outdoor guides. We take people fishing, hunting and canoeing. Odd, because we didn’t really set out to do the kayaking & canoeing guiding, it just "happened." We wanted to provide some family activities, so that when a fishing or hunting client brought along the wife and kids, there would be something fun for them to do. Ron has been a NZ Canoe Association Instructor since not long after that very first Clarence River trip. Disappointed at not completing the river first time down, he has made many descents since, leading diverse groups. He already owned several kayaks, and bought some more by tender. Somehow, a bunch of Aussies found our www.fishing-hunting-canoeing-new-zealand.com Web site, saw the canoeing photos, and wanted to know if we could set up a tour for them. "No problem" said Ron! Its funny where life takes you, huh? So, we eventually end up with some clients from Australia, with the itinerary being a trip down all the great rivers on the West Coast in the Lake Brunner region, followed by a trip down the Clarence to top off their holiday. I talked my son-in-law, Jon, to join us for the Clarence trip. As he is a novice, Ron takes us all to the pools at QE II park, on Monday & Thursday evenings, for weeks for kayak lessons. The little stunt boats at the pools are lethal, rotating at the blink of an eye! I’d already decided that we really needed to hire or steal a raft to act as a supply ship for this expedition. Not so much because I personally did not want to kayak the river, but in order to provide some comforts for the paying customers. Well, that’s my story, and I’m sticking to it! We acquired a Southern Pacific 3 man raft in plenty of time for the Clarence trip. In fact we gave it a few outings on West Coast rivers, to get the feel of controlling and managing it, and were real happy with the way it performed. Except perhaps with the amount of resistance a head wind could apply to it! Construction of a decent upper frame for support, and to mount a seat, was an obvious requirement. This was built from heavy walled plastic tubing, and worked well. Powered by kayak paddles, the raft is about a metre wide, and 5 metres long, surprising stable, and sits nice and high in the water. I like it a lot! Especially when compared to a kayak! The loading is carefully planned, with chilly-bins, (or eskies, if you are an Aussie) tarps, dry bags, cargo bags etc picked and fitted. Ron drops us off at the Accommodation House, at the mouth of the Acheron River behind Hanmer Springs. With all the gear stowed, lashed, and shipshape, the team of 4 set off down the mighty Clarence, into the unknown. The Aussies are good! Kevin is very smooth, making it all look effortless as he relentlessly seeks out the tricky bits to play in as we go. Laura is a very cool lady, poised and calm, great at picking the best (safest) line, and revelling in the landscapes. Jon is going well, practising the strokes Ron had taught him, coping well with the occasional rapid. The first few hours are easy, the valley is wide and flat, but in the distance, creeping closer, the mountains close slowly together. The Dillon River, our first campsite on the journey of 20 years before, comes and goes. As we enter the mouth of the gorge, I marvel at the contrast of that first trip. On the raft, it is so much less frightening. I know that I’m in control, that we are well equipped, and the majority of the team are very experienced. Jon, although a novice, is a powerful swimmer, very strong and capable, level headed and enjoying himself. The first few ugly bits are fun, just one swim for Jon. He forgot to keep paddling! Then comes the chute, and the pinnacle – completely different to 20 years before, the angle of approach is different, as is the river bank, and the water volume. It seems like the whole river bed has lowered itself deeper into the gorge, there is more rock exposed than submerged, and no obvious line through the cauldron. Kevin slides through without incident, I run it with the raft, and get tucked into an eddy in front of some boulders, waiting for the rest of the team. Laura makes it look easy, but Jon forgets everything he’d been taught at the sight of this seething mass of rolling water – he takes a swim before he hits the worst of it, and gets some wicked shin bruises for his trouble. Gasping for breathe, he struggles to the rocks beside me, chest heaving with exertion, looking pale and apprehensive. An empty out and back into the boat, and he makes another pool or two before his third swim of the trip. Yes, I’m keeping count! Kevin and Laura give Jon some coaching as we go, and his confidence returns as his skills improve. No more swims that day. The raft is proving to be as good as we’d hoped. It is heavily laden with the camping equipment, food, clothing and bedding. Aside from one disturbing incident, when I misjudged how much momentum it attained, it has gone well. The river plunged headlong into a rocky bluff, and I expected the hydraulic cushion effect to help me around the corner. However, the sheer momentum of the raft saw me bang into a boulder, nearly throwing me off! That caused a major rethink on technique, and from that point on the setting up for corners was a real focus for me. Perfecting that early made the trip very pleasant! The only other time I got into trouble was an unnoticed white rock tip which snagged the front in a rapid, spinning the raft and tipping me off. Aside from a couple of good bruises, and loss of dignity, I was unscathed. The others did not see exactly what happened, which made me feel better! Camping the first night, down around the Palmer Stream in a grove of willows, the talk is exuberant, the mood relaxed and happy. A wine or two, and an excellent dinner, washed down by coffee for kiwi’s and tea for Aussies. The double airbeds are wonderful. Well, its no use getting old if you don’t get cunning, right? When I was young I’d sleep on the stones, not anymore! The river murmurs pleasantly in the background, promising fun and adventure tomorrow. The night is warm, the stars are brilliant, and the only interruption to sleep is the two possums that have a play with the crockery during the night! Morning dawns clear, calm and warm. Breakfast is good, the smell of bacon and eggs accentuated as always by the freshness of the mountain air. A 9am start on the water, the early sun and absence of cloud promising a scorching summer’s day ahead. This long upper section of the river is easy going. The raft is a pleasure to manage, having established the technique for picking the correct line through the corners. The really good thing about it is it slows the pace down, giving us to time to appreciate the splendour of the landscapes that unfold. The second gorge is again a non-event, easy water with no drama. A spectacular rock cliff is a major feature, rising vertically some 500 feet out of the river. You could break your neck trying to look straight up to the top of it from the river! It proves impossible to get a full height shot of it with my Olympus camera, to my disappointment. This time around, I am amazed at the topography, geology, and flora. Here we are, in a virtual alpine desert. Stunted scrub bushes cling to life on raw grey rock thin soils, and sparse grasses burn dry in the relentless summer sun. Towering mountain ranges, bleak and beautiful, stretch from horizon to horizon. What a hell of a place it would be in winter, is the collective view! Today, in mid-summer, it is stark and beautiful. And not a cloud to obscure a mountain or mar the day. Late afternoon sees us slip past the Muzzle Station, the only inhabited portion of the valley. A lonely sheep and cattle run, so isolated it is hard to believe that people would choose to live here! In fact, there can be few places so far from civilisation in the entire country! The geology is very interesting. Hours before the Muzzle Station, occasional limestone stones and rocks appear in the river bottom. Then, miles after I first noticed these, there are low rolling limestone hills and outcrops along the valley floor. At some point, the river must have been an ancient fjord, prehistoric oceans filling the valley. Centuries of erosion, a massive upheaval, and the valley is now a thousand feet above sea-level. Amazing! The other neat thing I notice along the river bank is a wall of papa mud-stone, soft and eroded. It spawns big rock eggs, like the Moeraki Boulders, a famous tourist landmark on the South Canterbury coast. Rocks in the mud-stone create a chemical reaction, and over thousands of years a "shell" grows around them. Some are huge, 2 metres through! Others smaller, like footballs. In some cases the big ones have fallen out of the cliff and rolled done into the river, leaving an egg-cup impression in the cliff. There is just one place like this on the river that I saw, most unusual! The evening halt is a hour or two below the Muzzle Station, with Mt Tapuae-O-Uenuku majestic and dominant behind our tents. What a place! 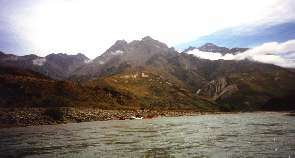 Some people come all this way by kayak, then climb the mountain before completing the river trip. Insane! Well hell, this is a serious mountain! It is near 9000 feet and ominously vertical in the upper sections. I mean, I like climbing mountains as much as the next man, but there are limits! On a kayak trip? Yeah, right! We are lucky with the weather, a bit of a north-west wind blowing but nothing dramatic. Laura decides to dry out the tent, and is vastly amused at the way the wind inflates it like a kite. She put a peg in on the two front corners, and it stayed tethered and inflated for ages! The fly rod proves superfluous, as there appear to be no fish at all in this section of the river. As a fishing guide, I’m expected to produce the goods, but cannot even see one, let alone catch one. I tried hard, but we are in for steak, spuds and veges for dinner. Still, its quite acceptable, and the steamed pudding and custard surprised the team a little! Took their minds off the lack of trout, if nothing else! A couple of hours underway through relatively easy waters sees the onset of the third gorge. This is a serious piece of water, and twists and winds some 70 kms! I have no trouble understanding why it was I was so scared the first time down it, 20 years odd ago. Some of these rapids are just wicked, a real blast! Jon has one swim today, which is really great as he has now equalled my record. He is really determined not to exceed four, although I try hard to persuade him to demonstrate eddy turns, wave surfing etc. He just grins, keeps paddling the easy lines. A couple of times, I sneak up behind him on the raft and try to ram him, but the kayak’s acceleration easily leaves the raft behind. Overall the river is graded as Grade II+, with Grade III rapids. Certainly, most of the river is easy, Grade II+, and no problem at all. However, some of the Grade III rapids are very serious prospects indeed. They drop at an alarming rate, are boulder studded, albeit with sufficient gaps to make passage possible. River flow influences the degree of difficulty a lot. Some will become easier, with more options in terms of inside lines etc. Others will become even more frightening, I suspect! The names are ominous – Jawbreaker, for example! I read somewhere that "The Clarence is an excellent open canoe journey." Yeah, right! Well, if you like bailing, it would be great….. Even on the raft, the water went over my head several times! With an open canoe, common sense would dictate a portage or two as being appropriate on quite a few rapids. With two people padding, co-ordination and skills would need to be finely tuned to escape swamping disasters, or worse. We all agree that only the most skilled of open canoeists could hope to negotiate the river unscathed. The river twists and zigs, zags and winds. Tussocks give way to manuka trees, and goats are everywhere! Hundreds of goats, stinking things that they are. I don’t like to see them here, knowing full well the enormous damage they do to fragile eco-systems. Introduced by the early whalers and settlers as a potential source of food, they and other such animals have penetrated far and wide into the alpine countryside. Evening finds us in the lower reaches of the gorge, and a comfortable campsite is constructed on a bank under the manuka, sheltered and warm. The only damage to date is Jon, who is suffering badly from chafing. The Dura touring boat is a little small for him and his lower back has rubbed raw, even with the padding of heavy neoprene wetsuit. His feet are also sore, as he has to sit with toes point like a ballet dancer. The boat is not deep enough at the point his feet reach, that’s the biggest problem with being 6ft 4in tall in a boat made for Mr Average, I guess. An 8am start to another fine morning, and it’s a cheerful troop of paddlers who set out into the river. About 9am, a turn in the river reveals 3 deer having a drink mid-stream, highlighted in the sun as we approach silently from the shadows. Kevin and Laura get within 50 metres before the deer decide that is close enough, and gallop off. The spray flying, bounding deer, what a glorious sight! We all get a buzz from that, and the only regret is it all happened so quickly, no one though to grab for a camera. As on the first trip, we discover signs on civilisation not long after commencing the final section. A 4WD track, a fence. Cattle. And as before, the exit from the gorge is sudden, an abrupt change of landscape to rolling limestone hills. We’d promised Ron we’d meet at lunch time at the Glen Alton bridge, his role was to bring a picnic lunch. The river from the gorge to the bridge is wide and flat, gravelled and braided, and takes forever to cover. Still, 12:45 pm sees the crew dragging bodies and boats into the shade of the bridge. Ron had only arrived minutes before, had not even had time to doze off in the sun! Lunch is superb, fancy sandwiches, little savoury pies, assorted fruit, hot coffees. Bloody marvellous! We stack all the gear in the truck, but everyone wants to boat the last few kilometres down to the State Highway bridge. Jon decides to join me in the raft. With renewed energy, we power off, a drag race between the 2 guys on the raft and the two kayaks. This last portion of the river is very, very enjoyable. All the more so, knowing the victory that fellow-canoeists have had in protecting it from exploitation. TranzRail wanted to extract thousands of tons of the very rocks that form these rapids, to build a breakwater for the new ferry terminal up the coast. They lost, the good guys won! Co-ordination was a challenge in the raft, but we soon decided I’d steer, while Jon would just paddle like hell! Some of the rapids are amazing. Kevin and Laura stayed some 100 metres ahead of us, and would completely disappear over the brink into the maelstrom of whitewater and boulders. Eventually, the sight of helmets bobbing in the distance downstream would indicate both success, and the dimensions of the drop that awaited. Awesome! We had to stop and empty the raft numerous times, but boy, was it fun! All too soon the State Highway 1 bridge was upon us, and the trip was over. Completed. Finished. Mission Accomplished. Jon gave us all a laugh, instinctively leaning his body into the first corner as we drove off homewards. This was a trip we had all unanimously enjoyed! The weather could not have been better, the company was great, and we all gained a lot from the experience. So much so, the Aussies are already planning a return visit for next summer. After showing the videos and photos around their canoe club, there is a full crew wanting to come over and check it all out. As for me, there is much personal satisfaction and pleasure in showing others the wonders of your own country, a renewed appreciation of the austere beauty of those remote mountains that protect the mighty Clarence. Can’t wait for the next trip…..